You know what you’re getting with Trader Vic’s. The international chain of tiki bars always delivers on the cocktail front. You know what you’re getting with Trader Vic’s. The international chain of tiki bars always delivers on the cocktail front. 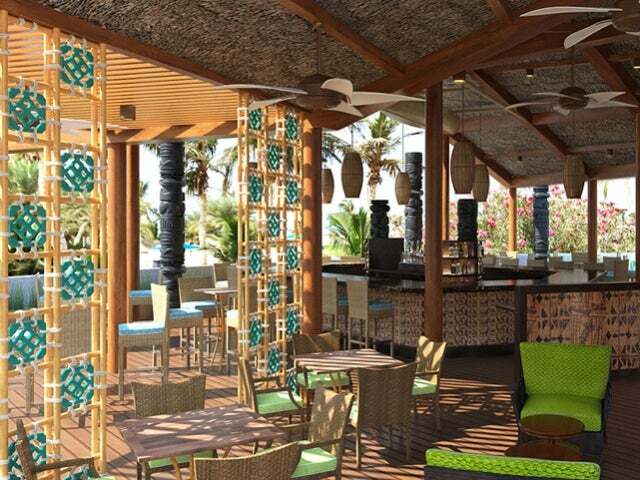 Creating a true tropical Polynesian experience in the heart of Ras Al Khaimah, Trader Vic’s Mai Tai Lounge is one of a number of drinking and dining options at the elegant Hilton Al Hamra Resort. The bar itself is a spacious lounge and restaurant, ideal for chilling out after a hard day’s golfing or a sojourn on the sands. It’s a stylish hang-out, peppered with green and yellow, where you can relax on comfy sofas in the shade of palm trees, the sun soaring overhead as you sip exotic tiki concoctions – including the signature Mai Tais from which the place takes its name. If you’re peckish, there’s a choice of tasty bar nibbles, ideal for sharing, but really the thing to do here is order a refreshing, fruity – and potent – cocktail and soak up the spectacular views.